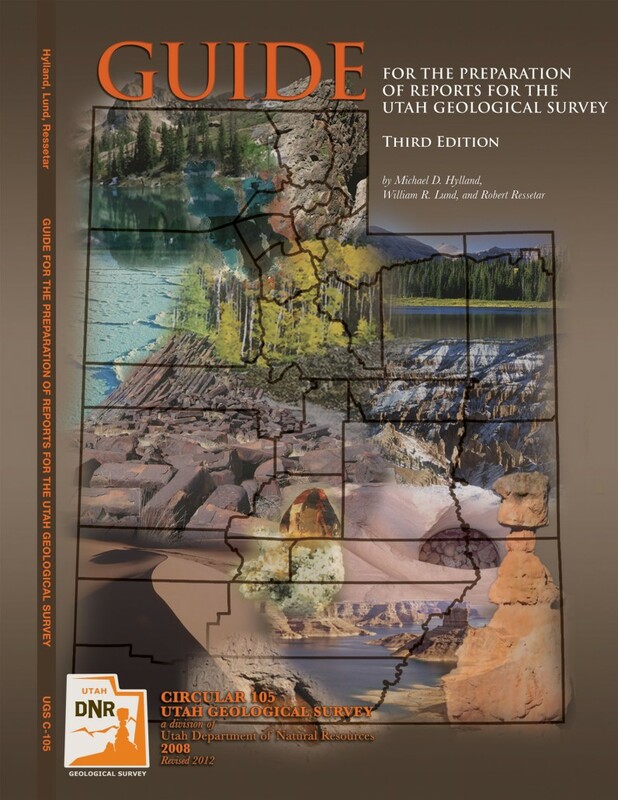 Utah Geological Survey reports and maps are released in a variety of publication series that are intended to accommodate documents of different purpose, project scope, and target audience. The series differ in terms of authorship requirements, level of technical review, and editorial and format standards. The criteria for individual UGS publication series have changed over time, and some publication series used in the past have been discontinued. The descriptions below summarize the current (since 2008) differences between the UGS publication series, and indicate the series that have been discontinued. Some UGS publication numbers have a “DM” designation appended (for example, UGS Map M-276DM). The “DM” (“digital mapping”) designation is applied to publications where geologic mapping is the primary focus of the publication, and where the geologic mapping is represented by geographic information system (GIS) files. Publication series where the “DM” designation is used include Maps, Miscellaneous Publications, and Open-File Reports. Other UGS publication series (e.g., Special Studies) where geologic mapping is not the primary focus may also contain GIS files, but these publication numbers do not receive a “DM” designation. Bulletins are topically and/or geographically comprehensive in nature. They may contain mostly original work or consist of a comprehensive synthesis of existing data of potential interest to a relatively broad segment of the scientific community. Bulletins are authored by UGS staff but may have non-UGS co-authors. Bulletins undergo the full UGS review process to ensure that they satisfy both scientific and format standards, and the UGS stands behind Bulletins as substantive scientific works. Bulletins require at least two formal peer reviews by subject-matter experts. Circulars address timely subjects, have a limited “shelf life” (may be subject to periodic updating), and typically are geared toward a relatively wide and non-specialized audience. Circulars are authored by UGS staff but may have non-UGS co-authors. They undergo the full UGS review process to ensure that they satisfy both scientific and format standards. Circulars require at least one formal peer review by a subject-matter expert. In the past, reports by non-UGS authors who conducted research under contract to the UGS were published as Contract Reports. This publication series was discontinued in 2002, and reports by non-UGS authors (both contracted and non-contracted) are now generally published as Open-File Reports and Miscellaneous Publications. The UGS publishes many types of maps in its Map series, including original and compiled geologic quadrangle maps, economic-resource maps, groundwater recharge- and discharge-area maps, and various geologic-hazard maps. Maps undergo the full UGS review process to ensure that they satisfy both scientific and format standards, and the UGS stands behind documents published in the Map series as substantive scientific works. Maps require at least two formal peer reviews by subject-matter experts. Geologic quadrangle mapping by non-UGS authors is typically published as a Miscellaneous Publication and undergoes review commensurate with that series. However, in cases where the review meets the level required for a UGS Map and at the discretion of the UGS, geologic quadrangle mapping by a non-UGS author may be published in the Map series. Maps may comprise multiple plates and may have an accompanying text booklet. Miscellaneous Publications comprise the principal publication series available to non-UGS authors. Miscellaneous Publications may be substantive scientific works, but do not necessarily conform to UGS editorial or format standards. Miscellaneous Publications typically take the form of a single report on a single topic (non-UGS senior author) or a number of different reports on related topics (non-UGS authors, but UGS volume editor or compiler). Miscellaneous Publications receive varying levels of review depending on the specifics of authorship. Monographs were intended to be the most comprehensive of UGS studies, but only three Monographs were ever published. Released in 1972, these three volumes comprise a statewide compilation of coalfield data. This publication series was formally discontinued in 2002, and topically and/or geographically comprehensive studies are now published as Bulletins. Oil and Gas Field Studies present data pertaining to specific oil and gas fields in map format. This publication series was discontinued in 2002, and oil and gas-related studies are now published as one of the currently used UGS publication series, as appropriate. This publication series contains documents intended to stand either temporarily or permanently with minimal technical review and editing. Open-File Reports are convenient for releasing timely information to the public, heavily data-laden reports and databases, and preliminary maps and manuscripts that will be superseded after more data are added and/or more rigorous review and editing. Open-File Reports may have either UGS or non-UGS authors, and they receive limited UGS review. The Public Information Series consists of brief topical reports or brochures designed to make nontechnical geologic information available to the general public. Documents in this series may have either UGS or non-UGS authors. The documents undergo the full UGS review process to ensure that they retain scientific accuracy, but they do not necessarily conform to UGS format standards. Documents in the Public Information Series require at least one formal peer review by a subject-matter expert. Reports of Investigation present the results of site-specific or project-specific investigations undertaken by UGS staff. The investigations involve original work and are generally of limited scope and/or duration, and the resulting reports typically are of interest to a local audience and receive limited distribution. Reports of Investigation allow for more flexibility in format and content than Bulletins, Special Studies, and Circulars, but they nonetheless undergo the full UGS review process to ensure that they retain scientific accuracy. Reports of Investigation require at least one formal peer review by a subject-matter expert. A Report of Investigation may consist of a single report on a single topic, or a number of different reports on related topics. Special Studies are similar to Bulletins in being substantive scientific works; however, the subject matter of Special Studies is typically more restricted than that of Bulletins. Special Studies generally contain significant amounts of original (non-compiled) material, and are of potential interest to a relatively broad segment of the scientific community. Special Studies are authored by UGS staff but may have non-UGS co-authors. They undergo the full UGS review process to ensure that they satisfy both scientific and format standards. Special Studies require at least two formal peer reviews by subject-matter experts. The UGS publishes its official newsletter, Survey Notes, three times a year. Survey Notes is a nontechnical publication, and normally contains several related articles that highlight recent work related to one of the UGS programs. It also contains several regular feature articles and UGS news. All articles undergo the full UGS review process (with the exception of formal peer review) to ensure that they satisfy both scientific and format standards. Although articles are typically authored by UGS staff, non-UGS authors may also publish in Survey Notes. Water-Resource Bulletins present the results of studies pertaining to water-related topics. This publication series was discontinued in 2002, and water-related studies are now published as one of the currently used UGS publication series, as appropriate. How to prepare reports for UGS: The following guide describes the UGS publication process and lists publication series available to UGS and non-UGS authors; contains technical and stylistic information providing a primary reference for authors of UGS reports.